Thanks to everyone who made the 2015 Garden Tour a success! WHAT DO YOU GET when you combine six wonderful gardens with eight talented Carlisle artists? The memorable Art in Our Gardens tour of 2015! Enjoy this slideshow and and visit our online gallery of art for more views. Thanks to all the club and community members who made it happen. The Tour was a triumph in so many ways. We greeted many more visitors, found new advertisers, tried a lot of new things, and learned a lot. We made record sums of money, which is heart-warming when your is to raise funds for a charity. Throughout the planning process, we worried about whether we were inviting too many outside volunteers, undercutting our fundraising efforts. I am happy to say we gave away a record number of free tickets AND we had record proceeds – indeed a happy place to be! The art was a gamble – could we make it work without making ourselves and everyone else crazy? Well, the artists were wonderful, and everyone loved viewing the art in spectacular settings. Everybody won. Most of all, we felt proud to be part of such a fine project, one where many people played multiple roles (dispursing and corraling signs AS WELL AS managing or hosting in a garden, for example). It’s a time-honored Garden Club tradition that we all “pitch in” to make it happen, and it’s a thrill when you’re part of it. We want to take this opportunity first to thank all those in and near the club who worked to make it happen. TO Nancy Jaysane and Jane Williams for quickly selecting a half dozen wonderful gardens. Of those, two belonged to club members: Melinda Lindquist and Peg Gladstone, while a third owner, Victoria Rizzi, rejoined the club just before the Tour. Our hearts went out to the owners as they worried about winter damage, winter moth damage, then the drought (“will it never rain?”) and finally the weather (“please don’t let it rain during the Tour”). Miraculously, it all worked out. TO Bonnie Miskolczy, for her vision and expertise in organizing our fabulous Carlisle artists, and to Katherine Dhar, who undertook to manage this trailblazing challenge, which made all the difference in this wonderful tour. AND TO our outstanding artists, each marvelous in his or her own way: Jic Davis’ Girl in Stone; Bonnie Miskolczy’s Flower and Pollinator made from found objects; Glen Urban’s steel structures, along with Claire King’s ceramic bird spa and Karin Lemmerman’s ceramic fern and leaf plaques and ceramic vessels. Their small-scale work graced the incredible rock garden at the Gladstones. Then there were Tom Veirs’ plein air paintings and great conversation, and Sally Zielinski’s oil paintings of botanic and rural scenes, and Jon Golden’s wittily conceived compositions of salvaged metal. We suspect that many of our attendees bought tickets just to see the first-class art show! TO Cecile Sandwen for her fabulous Mosquito interview with some of the artists in our gardens – and for her tireless, backstage efforts to get the word out across Eastern Massachusetts and southern New Hampshire! Our attendance essentially doubled this year, and we move forward with a whole new following. AND…. TO all our members, who papered Middlesex County with our beautiful postcard flyer, conceived by Meghan O’Sullivan from a photo by Cary Spanbauer. TO all our Garden Managers, expertly coordinated by Nancy Jaysane and Jane Williams, Judy Blaikie Lane, Christie Cocanour, Patricia Koenitzer, Gio DiNicola, Jane Anderson, Holly Salemy, Nancy Jaysane, and Esther Long Krapf. The ensemble kept both days humming smoothly. TO Barbara Lewis for her consummate placement and management of more than 80 volunteers – and for organizing the Carlisle Artisans to offer a gracious respite in Center Park during and after the Tour. TO Gio diNicola and her team of Elizabeth Acquaviva, Judy Blaikie Lane, and Debbie Bentley for achieving record advertising sales -- totaling almost $4100! And special thanks to Gio, who pioneered the use of “sponsorships” for the club, which opens a new, exciting level of support for our fundraisers. TO Alison Saylor for staging the plant sale, and parlaying our garden plant divisions into almost $900 -- with zero expenses! TO Margaret Read-Veirs and Nancy Kuziemski, who organized the advance ticket sales and ticket booth, and are writing a detailed record of what they learned worked, and what didn’t. TO Nancy Jaysane, whose informative garden descriptions graced the Tour program booklet; to Judy Blaikie Lane for her guidance with booklet layout; and to Joeth Barlas for producing the camera-ready booklet. TO Jane Anderson, for efficiently managing the updating, distribution, and retrieval of the Tour signs. TO Nicole Burkel, for keeping the books, reimbursing expenses, providing cash boxes and seed money, and tracking it all at the end. TO everyone who sat at gardens, hosted signs, picked up balloons or water or traffic cones, dug or potted plants and helped with the plant sale. TO Cary Spanbauer, our “official” press photographer, who took definitive pictures of the art and the gardens. His pictures from the 2013 tour were used for publicity with our fabulous postcard, as part of the online gallery, and for the 2015 slideshow above! THANKS ALSO TO THE COMMUNITY MEMBERS WHO MADE SUCH A DIFFERENCE. Immense thanks to the six garden owners who groomed their properties and generously offered visitor demos, and to the eight artists who transported/installed their creations to delight visitors. Thanks to the generous “outside” volunteers — including student volunteers — who stepped up to ensure we were fully staffed. Thanks to our very own Ferns Country Store and New England Nurseries in Bedford for providing gratis advance ticket sales as a community service. Thanks to First Religious Society and the Board of Selectmen for permission to use the Common for our ticket booth and plant sale. Thanks to all who hosted signs and tolerated any traffic or parking issues we introduced. Thanks to Carlisle institutions that supported the Tour: Gleason Public Library, who arranged a display of our 2015 Gardener’s Booklist, and toCarlisle COA, who arranged shuttle service; Bert Williams, who made himself available to drive the van; and Carlisle Congregational Church, who offered parking space. Kudos to the Carlisle Mosquito, who printed Tour news throughout the entire cycle, and provided crucial coverage as the grand day(s) approached. Special thanks to community gardeners who called or emailed to offer donations to our plant sale on the Common. Generous thanks to the Carlisle Artisans, who set up welcoming seating in Center Park where visitors could have lunch or enjoy some liquid refreshment. We gratefully acknowledge our corporate sponsor, Prime Lending of Concord, and all the booklet advertisers who made the event possible. 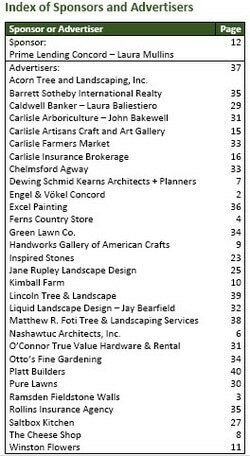 The following section has an archive of the 2015 Tour booklet PDF and an index to our advertisers where you can locate and support these local businesses to thank them for their important role in our fundraiser. It takes an entire community to create such an event. We thank each of you for the key role you played.